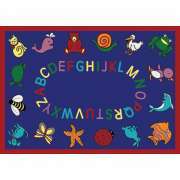 Putting the finishing touches on your classroom can be lots of fun, especially with fun ABC rugs to choose from. A combination of colorful graphics, durable materials and educational designs make these classroom carpets a practical, aesthetic choice for your learning space. Alphabet rugs come in a variety of shapes and sizes so you can enjoy this fun selection in many different spaces. Whether you are looking to furnish the reading corner or create a new space for circle time, they create a cozy and inviting space, and even encourage little ones to practice their letters. 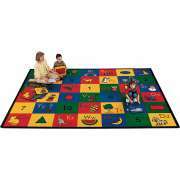 These carpets can even be incorporated into lessons, games and classroom activities. 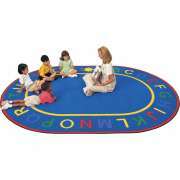 Where can I get ABC rugs for my classroom? Hertz Furniture has a wonderful selection of styles for any learning space. 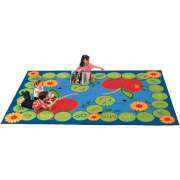 ABC rugs are especially good for early-childhood classrooms, preschools and kindergartens. 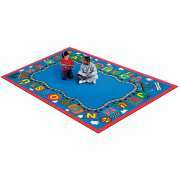 We have attractive designs from top kids rugs manufacturers including Joy Carpets, Carpets for Kids and Learning Carpets. These models are designed to look great through years of use and enjoyment by your youngest learners. What kinds of alphabet rugs are there? 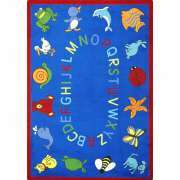 There are lots of different styles, shapes and sizes to choose from when it comes to alphabet rugs. All of the choices we have are meant for high-volume classroom use but they feature different designs. You can choose a colorful rug that is divided into squares and includes numbers letters and beautiful graphics. There are also great designs which include shapes or fun pictures of animals. 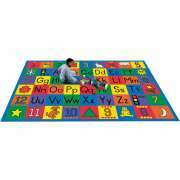 To maximize the educational value of your purchase, there are even classroom carpets with a picture to match each letter of the alphabet. Where can I get ABC rugs in Spanish? It’s never too early to start teaching little ones a second language. 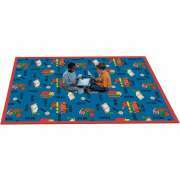 Bilingual rugs encourage young students to develop proficiency in a second language. In the same way they can become engaged in learning by looking at the alphabet in English while at play, they can also enjoy the same benefits in Spanish, French or any other language. What activities can you do with an alphabet rug? 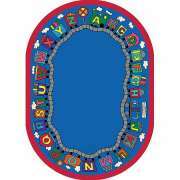 There are tons of fun things you can do with your class that are centered around alphabet rugs. You can ask little ones to find a particular letter and stand on it. You can base a scavenger hunt on rug graphics. For more advanced and older students, you might want to consider the ABC feelings rug. The graphics will help encourage emotional development, more advanced vocabulary, reading and letter recognition. 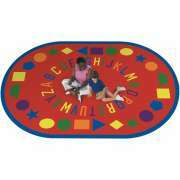 Liken any piece of classroom furniture, the ideal size for alphabet rugs depends on where you want to put them. Many of the designs we have come in multiple sizes, and sometimes even multiple shapes as well. Some common spaces where you might want to fit one are in your circle time area, reading corner or in front of the board. No matter where you want your rug to go, it is always important to take accurate measurements before ordering to ensure a perfect fit.